Please call our After hours number 253-353-4602 or please fill out our make an appointment form here. Do you have an emergency plumbing problem, such as a broken water or sewer line? Do want a knowledgeable, fast plumber right away? Is it a weekend or the evening maybe? Does the plumbing in your house need work but can't make an appointment until after your work day has been complete? You have come to the right place for 24 hr emergency plumbing services. We can meet all of your plumbing service needs at any time throughout the day or night. Remember Acqua, A C Q U A, not to be mistaken for AQUA, we are not that kinda of Aqua plumbing. We are Tacoma-Seattle's #1 Trenchless, Sewer Repair, Plumbing, and Sewer Replacement Company of Washington. We back this up with our Customer Satisfaction Guarantee, and Lifetime Warranties on most if not all our produces. We have been family owned and operated since our conception, serving the Tacoma-Seattle Areas for over 16+ years. You don't want the headache of your plumbing and sewer system not functioning properly. It's important you have people who you trust perform your plumbing and sewer repairs, repairs you need done quickly with reliable service. You can always count on Washington's Smart Plumbers here at Acqua Plumbing for all your plumbing, sewer, and drain needs in and outside your home, smart fast, friendly, reliable, affordable plumbing, each and every time to you. Acqua Plumbing Seattle-Tacoma's #1 in customer service and Satisfaction. Acqua Plumbing's highly skilled and trained professional technicians can handle any emergency plumbing problem that you our customer may have. We will make sure you plumbing, and drainage system is working properly, with no defects. If you may or may not be a business owner or home owner and are looking for just routine maintenance Acqua Plumbing is here to serve. Home Additions- Adding plumbing to the home. When it comes to your main sewer lines and water lines, peace of mind is something you can not afford to lose. Peace on mind depends on these systems being in working order. Sewer lines allow waste properly to exit upon your home, while water lines deliver water to your home. Your property's Plumbing and sewer system has an array of fixtures, fittings, and appliances, all of which have the potential to cause problems, and some even serious problem. Sewer backups, clogged lines, damaged pipes, and other issues with leaks. High water pressure, low water pressure, all of these demand the attention of true professionals. At Acqua Plumbing, Sewer, Rooter, &Heating, we provide effective solutions for plumbing emergencies and minor plumbing, sewer, and heating headaches alike. All of Acqua Plumbing supplied parts and labor are warranty per invoice discretion, along with all our Sewer System installs and repairs have a LIFETIME Warranty. Our 24 hour, 7 days a week 365 days a year plumbers have thebest plumbing knowledge in Washington and offer low upfront payment options. Acqua Plumbing are The Smart Plumbers of Washington because "from the faucet to the street our knowledge can't be beat! Make an appointment with Northwest plumbing specialists at Acqua today! After 6pm or before 7am? Call our after hours mobile number at 253-353-4602 for a quicker reply. Be Sure to take a look at our service area across western Washington. This map here shows all of Acqua Plumbing's coverage area. Acqua Plumbing Located at 4630 16th ST E, FIFE, WA. 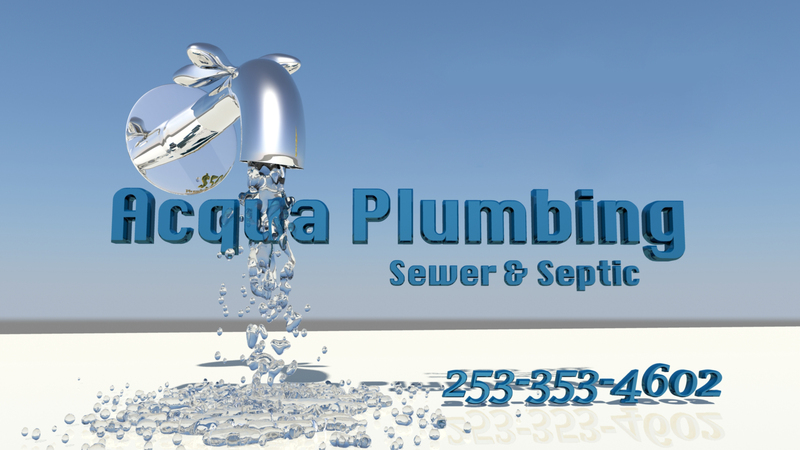 Phone: 253-353-4602. http://plumbing.acquaplumbingllc.com.